Stanley Kubrick could never be faulted for a lack of ambition but he was at his best and most audacious when restricted to genre. The Killing has the mark of a director determined to break free. The novel on which the movie is based is called Clean Break. Kubrick anticipates New Wave cinema and the technique of overlapping various narratives is a nod to the revolution inspired by Citizen Kane, as is the sharp but very dark black and white photography. The often inspired dialogue from master noir novelist, Jim Thompson, is merely a bonus. Kubrick is a special talent with the eye of a cameraman and the knack of avoiding clichés. Here, Kubrick is not interested in art-house obscurity. The audience realises quickly that the mutual friendliness and respect between the hip white assassin and black car-park attendant will not be maintained. Details, such as the caged budgerigar that represents the prison shared by George and his treacherous wife, Sherry, are emphasised. No one is surprised when the dying George drags the budgerigar to the floor. Johnny is the gang-leader and smart but he also wears a terrible shirt. The flaw in Johnny is obscure but we know it exists and are not shocked by the outcome. But in The Killing each scene has a surprise, it may be a line of dialogue or a camera angle but it will be there. Not that The Killing is merely about style. Two themes shape the movie, the relationship of reality to illusion, and how gambling and taking risks dominate existence. In the opening credit scene we watch newsreel footage of the beginning of a horse race. The newsreel film is a flashback but we only realise that later. Newsreel is used and repeated throughout the film. This was probably done for budgetary reasons but it suggests the difference between objective and subjective eyes. The presence of the anonymous narrator insists that the viewers are incapable of understanding what they see and hear. The anonymous narrator is also unreliable. He provides precise timings of the events but we know from the overlapping narratives that time is not consistent. Each character has a different story and not one begins at the same point. The characters in The Killing all have a partial understanding of what happened. They wait and wonder, unprepared for what eventually happens. 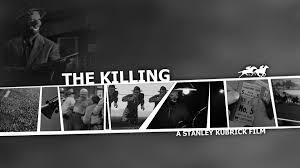 Posted in Film, Film Noir, Reviews and tagged film, film noir, Stanley Kubrick, The Killing on April 12, 2014 by Howard Jackson.